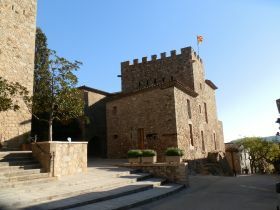 Castell d'Aro is a small Costa Brava town situated at the end of the Aro valley just up from Platja d'Aro on the coast - officially the area is Castell-Platja d'Aro and the village of Castell d'Aro is the older original village centre before the widespread influx of tourism. Being named after a castle, it's no surprise that the town has a small older part with the Castell de Benedormiens located next to the church. The castle is now a museum of dolls (Museu de la Nina). 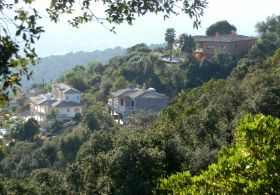 The village itself is at the base of the Gavarres and the hills climb to estates at the top that look over the Aro valley as it comes into the Costa Brava from the direction of Llagostera, and out to sea across the bay of Platja d'Aro. The old village centre is relatively small despite the presence of the castle, though well-preserved. Just down from the castle are more modern areas including a train track and one of the old carrilet trains that used to connect Sant Feliu to Guixols to Girona. Our aim was to explore the hills and get a glimpse of the views, but it would be fair to say there wasn't much at the top of the hill other than an obstructive golf course and the American-style villa houses. 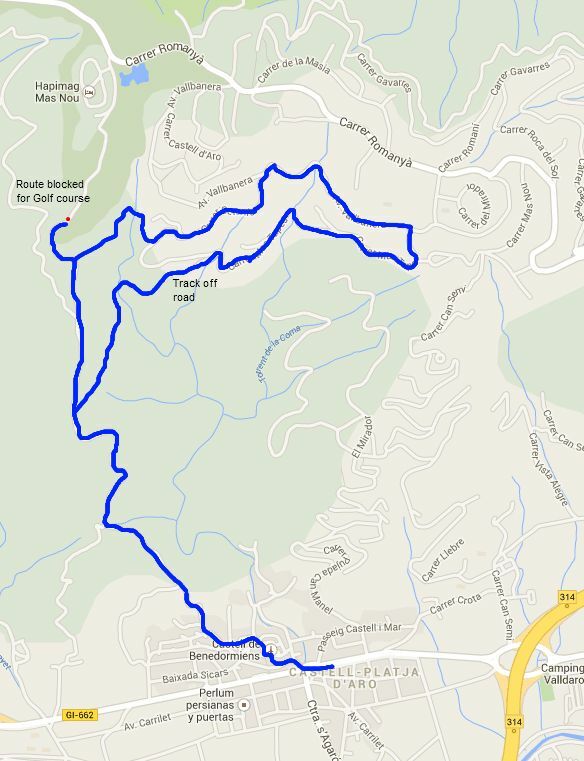 Our route starts in the town with a tour of the older parts then heads up the valley to find a right hand link up the hill. It's marked as a white road ont he map, but as we often find, these white routes often turn out to be gravel tracks. We walk up the track and slowly behind us we get views across the valley, out to S'Agaro and the beach at Sant Pol. The day isn't particularly clear for landscape photographs though. The climb up is steady and the day is surprisingly warm in the sun for December, but there is nothing particularly special about the path and few distractions or other routes off. As we get to the top, the route splits with the bigger track continuing to the left and a smaller track going straight on. We follow the straight on route which flattens out around with a steepish drop and views across the hills. Unfortunately, though it looks as if the track is well used, at the end it is blocked by a gate and fencing surrounding one of the greens of a golf course. The map had shown the route continuing so it's quite a big let down. Instead we double back to the nearest clearing and spot red markers and a small semi-overgrown track. We follow the track into the woods and undergrowth and it curves around the upper part of a small valley, arriving at the back of some houses in the Mas Nou estate. 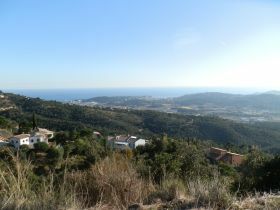 The estate has views to the south and down the coast and the high rises of Platja d'Aro are hidden by the curve of the hill. Most of the houses look enormous, built in the style of American estate houses. We're on tarmac now and follow the road path up and along towards the TV-mast. One problem with estates is they tend to curve and run up and down so it can be difficult to spot where the right turning is. We continue around the estate but beyond admiring the gardens, there's not that much to see. So we take the first right and wander back down (looking at the map now, if we'd taken the following right we'd have had a different route down). The road seems to be curling back to our starting point, but we find a track at the bottom and navigate a path, again overgrown and little used, back down the hillside. Eventually we rejoin the path we went up and return back to Castell d'Aro feeling disappointed both by the way the upper path was blocked, but also disappointed by the quality of the walk.